Call Me Adam and Joel Creasey at The Laurie Beechman Theatre in NYCLast November I saw a comedian whose name will be, if not already, on everybody's lips. That comedian was Joel Creasey! After interviewing Joel for "Call Me Adam," I had been hoping I'd get to see his show while he was in town. Well, as it turns out, I did get to see his show and I can flat out say, Joel Creasey is going to have a long comedy career! His comedy style was fresh. He told stories about life in Australia, his time on I'm A Celebrity...Get Me Out of Here!, opening for Joan Rivers, and his various dating adventures. While many comedians tell life stories, Joel had an ease to his style and delivery, not often seen with other comedians. Joel was engaging and had no difficulty putting smiles on our faces. Joel Creasey, Photo Credit: Ed Purnomo Joel Creasey, Photo Credit: Ed PurnomoI could identify a lot with his dating woes. One of my favorite tales Joel talked about was his time on I'm A Celebrity...Get Me Out of Here! Joel may have simply recounted the crazy events that happened on I'm A Celebrity, but the way he presented the events (like having to live with The Brady Bunch's Maureen McCormmick), he engulfed the audience, had us in the palm of his hands, and made us laugh so hard. My other favorite story Joel told was that of opening for Joan Rivers. I think this was favorite story because he showed a different side of Joan that not everyone got to see. He really described how Joan payed it forward with Joel, giving him some great advice about performing. It's advice he never forgot. 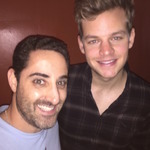 Joel Creasey Joel's fresh take on life experiences was a welcomed addition to the world of comedy. It was great to see a comedian breathe new life into a performance genre that can sometimes blend together between comics. If you missed Joel last year, now is your chance to see this hilarious, bright, comedy legend in the making when he returns to The Laurie Beechman Theatre (407 West 42nd Street, between 9th & 10th Avenue inside the West Bank Cafe) with a new show playing August 4, 5, and 6th at 7pm! Click here for tickets!